HHR SS Topics and information on the 2008-2010 Chevy HHR SS Turbocharged models. I would like to compare other SS's to mine. I just did a 120 mile trip without my tune on and got 18.3 mpg, which I knew average speed for that mpg. Couple weeks ago I did 2 trips on 2 consecutive days. Each was the same 200 miler on the interstate at 70-72 mph. 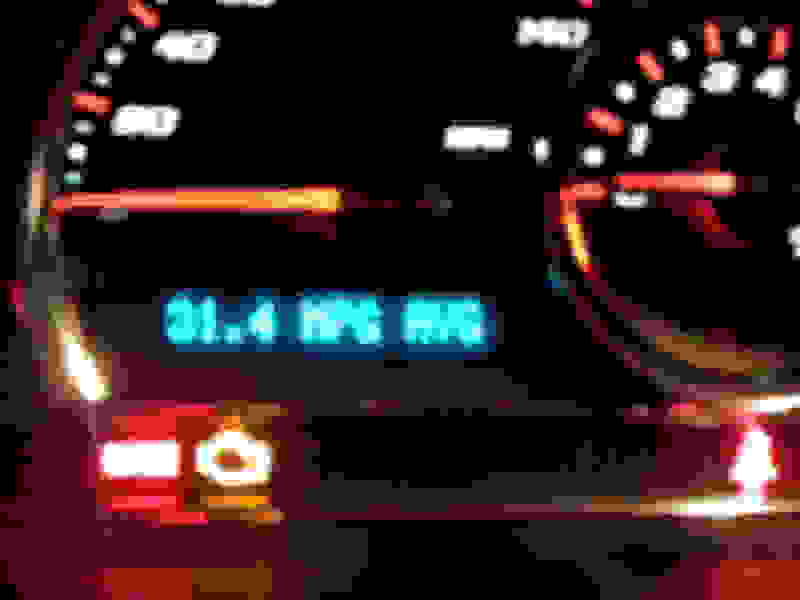 Both times I reset the DIC and saw 31.4 mpg when I returned home. Filled up the car after the 2nd and it showed the same mileage via pencil/paper so the DIC reading was spot on. George how many miles on your SS ? That gas mileage almost equals an LS. When I did my trip I did 70-75, but then would hit stop and go on the road. I have 55k miles on my SS. I wonder how the ECM computes mpg. I usually drive more around town than highway and this possibly might affect mpg readings. Maybe I can find something on this. I know your mpg can drop if the engine idles quite a bit. Which makes sense, but I've never had a car where the difference was so dramatic as my HHR. I do have aftermarket wheels on mine but don't know the weight. But it's a far cry between 31 vs 18 when comparing Georges car (with OEM wheels) to mine, when both of us have 55K. I've been logging my gas purchases and figuring my tank mileage since I got my car new in 2010. Have never been below 25 mpg per tank since the beginning. One thing different is my road conditions. I live in a rural area but it's all paved roads with most speed limits around 45-55 posted and stop signs and red lights pretty far apart. Those conditions make for some optimal mileage. I very rarely do any of that "city" driving. OK there are two differences I see. You don't do short runs and the GM tune upgrade was a plus. If I turn on my Trifecta tune mileage doesn't increase. I know the ECM learns your driving habits. In your case your mostly "highway" and it has taken that into account for possible better mpg ? George do you reset your mpg on the DIC everytime you fill up ? 18mpg is a horrible number. I average 27-30 with 90-10% hwy city driving. 2010 ss with 125k miles. Quick Reply: What's your highway gas mileage ?